A.J. has been in the fitness field for over 10 years. She first started as a recreation attendant while finishing college and receiving her BA in Environmental Studies. However, years of working in the gym and after losing 80 lb.s from having two children, she got inspired to help others reach their goals. She got her personal training through ACE and Group X through AFAA and started training at her gym on MCAS Miramar in 2008. 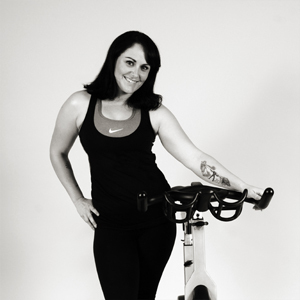 Throughout the years she has received certifications in Kickboxing, Spin®, Olympic lifting, HITT, TRX, ACE Life Style Weight and Management, and ACSM Certified Inclusive Fitness Trainer. She is now a fitness trainer and unit pt specialist for the Marine Corps and helps them become combat ready and injury free. She trains a variety of military clients that need weight loss, are wounded or injured or full units up to 100 Marines at a time. She also has worked at many outside gyms and has taught a variety of Group Classes. ….and so much more! I love music and making a killer playlist to help motivate a killer class is one of my favorite parts of teaching. Train for life! Train for longevity and a healthy life, looking great and confidence are just great side effects. Educational, functional, sweaty, and killer fun!